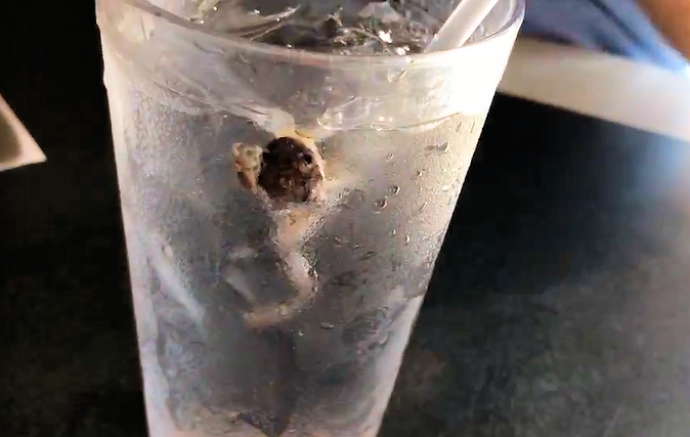 Tallahassee (WTFF) – A couple dining at Waffle House on Waldon Road off Mahan Drive found a frog inside their glass of water. “In my husband’s drink, there’s a whole frog just floating around in the water,” Claire Sheat said to wctv.tv. He had already taken a few sips. She dumped it out to get a closer look. Yep, definitely a frog. People in North Florida sometimes eat these raw, so we assume that restaurant-goers were ogling the delicacy. This restaurant has eleven health inspection violations not counting the frog incident. “The health inspector reports the 11 violations are not an immediate threat to the public,” reports WCTV. A staffer did come out to say “sorry about that guys.” It was not reported whether they said “y’all come back now, ya hear,” but they probably did.